The Maya Site of Copan in western Honduras is one of the most important sites of the Mayan civilization from the Classic era (5th century - 9th century AD). The site was abandoned shortly after 900. The main complex consists of the Acropolis and five plazas, with ball courts, temples and altar complexes. Highlight is the hieroglyphic inscription on Hierogplyphic Stairway Plaza. I visited the ruins at Copan on February 18, 2009 and stayed in the nearby village of Copan Ruinas, which lies only a 1km walk away along a specially paved walkway. On the walk, you'll pass several still unexcavated mounds and a sculpture or two. You can also take a taxi,which are really three wheeled pickups, for about $0.60. Unlike the Mayan ruins at Chichen, Coba and, as noted in the previous post, Tikal these ruins do not cover a wide area but what they do offer are many intricately carved stele or stone columns celebrating the accomplishments of several of the Mayan rulers of the city. These stele, most of them on a central plaza, inspired the noted archeologist Linda Schele to describe the site as "A Forest of Kings." Unfortunately two or three of the most beautiful stelae and sacrificial altars are represented by reproductions, the originals having been moved to the nearby museum. Entrance to the ruins, the museum and recently dug tunnels under the so-called "Acropolis" are separate. Currently it's $15 for this site (and Las Sepulturas), $7 for the museum and $12 for the tunnels for non-residents For most visitors the ruins alone would be enough, the museum is optional and the tunnels are interesting but not, in my opinion, worth the steep price. Plan on spending at least 3 hours at the site; guides are available and well informed. There are several nature trails also on the site A visit to the smaller "Sepulturas' site, 2km away along a special path that parallels the highway so you don't have to worry about being run over, is worthwhile if only to see the residential area and get an idea of daily life among the Maya as opposed to the ceremonial. Make that decision based on time, interest in Mayan ruins and history as well as the heat of the day. There are no refreshments available at that site or along the path so bring water if you go. Depending on your schedule and travel plans you should consider staying over in Copan Ruinas. Although the town is geared to tourism, with its souvenir and "craft shops" it retains a charm and laid back style in a beautiful setting. A stroll and dinner in the cool of the evening is certainly worthwhile and there is frequent bus service to other cities in Honduras as well as back to Guatemala. Honduras has its merits as a tourist destination but lacks the appeal of Guatemala with its indigenous peoples, historic sites and scenic variety. 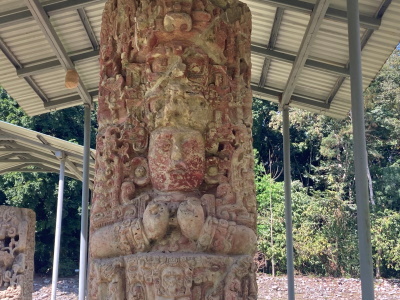 However, if you are basing a self drive holiday on Guatemala you can still easily visit one of Honduras’s 2 WHS at Copan since it lies very close to the Guatemalan border. We started from the motel (recommended) at Rio Hondo, crossed at El Florido and left our car at the border post as it is not worth the costs of taking it across the border (even if your rental company/insurance will allow it). Next pay the personal exit/entry charges for each country (you will need to pay some of them again on the return but not too excessive! Tell the both sets of authorities that you are only going to the ruins and thus avoid the need for a Honduran visa and make it easier to get back to Guatemala), change $ for a few lempira at the border and take a truck/minibus the 14kms to the Honduran village of Copan Ruinas (they go when full but pretty frequent). From there it is only a couple of kms to the ruins (many buses). Check the border closing times for your return before you set off as the countries don’t operate to the same timetable! It all sounds quite complicated but we really found it very easy. Copan as a destination does not, in my opinion, rival Tikal – one could easily spend 2 days wandering around that site - but is well worth the day of your time it will take to make the detour required to cross the border and spend the half day it warrants even for a non-specialist in Mayan ruins! Like Quirugua, the nearby WHS in Guatemala, the star attractions of Copan are the stelae but far more of the city is visible/preserved as well. My photo shows a ball court and Copan’s most famous monument, the Hieroglyphic Stairway (protected under an awning). 96 Community Members have visited.